Can SME Exchanges be the answer to the ﬁnancial constraints that plague Small and Medium Enterprises (SMEs) and frustrate their ability to grow? Nupur Pavan Bang writes from her research. Micro, Small and Medium Enterprises (MSME) are often associated with employment generation, poverty alleviation and innovation. Their smaller size and entrepreneurial passion enable these businesses to be more productive, promote competition and efﬁciency and contribute signiﬁcantly to the exports and growth stor y of nations. 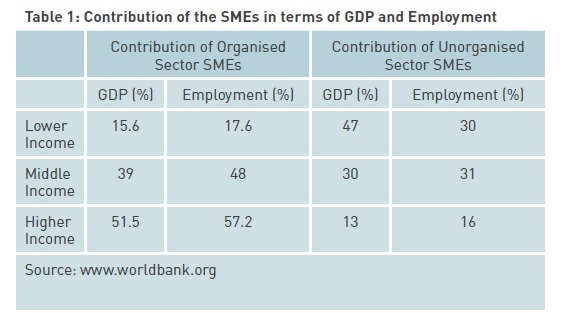 According to a World Bank study on Small and Medium Enterprises (SMEs), the contribution of organised and unorganised SMEs to the employment and GDP of nations is highly signiﬁcant (See Table 1). In India, the MSME sector is the largest generator of employment in the economy. In 2008, 92% of India’s total workforce of 457.46 million people was employed by the informal sector, which is largely dominated by micro, small and medium enterprises (MSMEs). The deﬁnition of MSMEs or SMEs varies in different countries. They may be deﬁned in terms of their employee numbers, investments in assets, revenues, paid up capital or a combination of these. In the Indian context, as per the MSME Development Act, 2006, micro, small and medium enterprises are deﬁned on the basis of of their investment in plant and machiner y (for manufacturing enterprises) and on equipment for enterprises providing or rendering ser vices. The World Bank deﬁnes MSMEs in terms of number of employees, total assets and total sales (See Table 2). In India, the registered MSME sector is estimated to comprise 1,563,974 working enterprises. Micro, small and medium enterprises account for 94.94%, 4.89% and 0.17% of this number respectively. The ability of MSMEs to grow depends on their ability to raise funds for investing in technology, expansion, innovation and research. This is the biggest challenge MSMEs face all over the world, whether they are in developed nations such as the US or in developing nations such as India or China. Once they have tapped the resources of family, friends and well-wishers, they are unable to raise additional funds as easily as larger and more established businesses. Research shows that the reasons for these ﬁnancial constraints range from regulator y obstacles (US) and legal and institutional barriers (Canada) to high costs of disclosure requirements during and post Initial Public Offering (IPO) for listed companies (India). 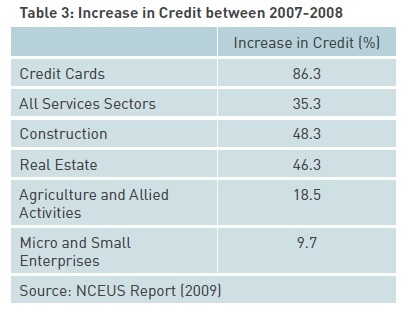 Limited access to capital makes access to credit important for this sector. However, a 2009 study by the National Council for Enterprises in the Unorganised Sector (NCEUS) on the challenges of employment in India, with a focus on the informal economy, shows that the growth in credit extended to micro and small enterprises was only 9.7% between 2007 and 2008. It was much higher for other sectors such as the ser vices, construction and real estate sectors (See Table 3). The same report also highlights that the overall availability of credit to small and micro enterprises as a percentage of net bank credit (NBC) of Scheduled Commercial Banks (SCB) declined from 15.5% in 1996-97 to 6.6 % in 2007-08. Ghatak (2009) explains that banks are reluctant to extend credit to small enterprises for several reasons, such as the high administrative costs of small-scale lending, asymmetric information, high risk perception and lack of collateral. The lack of ﬁnancial support to enable these enterprises to grow or meet their working capital requirements has a disastrous impact on them. The government has been taking steps to improve the situation on two fronts, bank loans and credit ﬂows. In 2000, it launched a credit guarantee scheme for collateral free credit to meet working capital requirements and provide term loans. 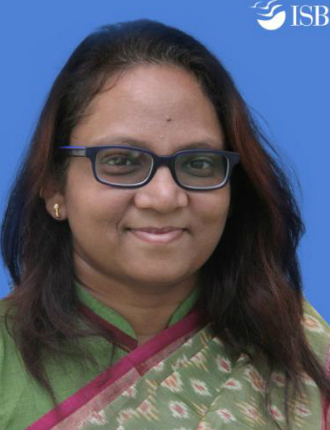 The Micro Finance Scheme, under which the government provides a security deposit to micro ﬁnance institutions against loans taken by the MSMEs, has been in operation since 2003. The Small Industries Development Bank of India (SIDBI) along with Dun & Bradstreet Information Services India Private Limited (D&B) and several other leading banks in India launched SMERA (SME Rating Agency) to provide comprehensive, transparent and reliable ratings for SMEs. The aim is to help SMEs get access to better credit at better rates and longer tenures. It also enables banks to make more informed decisions when extending credit to SMEs. Apart from the above, other initiatives by the government include promoting the use of technology and marketing, setting up clusters to build common infrastructure, providing guidelines to banks on priority sector lending and introducing the Credit Linked Capital Subsidy Scheme, among others. Despite these efforts, the gap between access to ﬁnance and the needs of MSMEs remains vast. In a bid to address this issue, the Prime Minister’s Task Force recommended the establishment of a dedicated Stock Exchange/ Platform for SMEs in Januar y 2010. The Bombay Stock Exchange (BSE) and the National Stock Exchange (NSE) launched their SME trading platform in March 2012. To be eligible for listing, an SME must have paid up capital of R 10 crores. It’s paid up capital post issue must not exceed R 25 crores. If it goes beyond the R 25 crore limit, there will be a compulsory transfer of the SME to the main exchange. SEBI has ensured that the costs of meeting listing requirements are minimal in the case of the SMEs. For example, SMEs may send abridged versions of their annual reports to investors instead of the full annual report and make the entire report available on their website. However, SMEs are charged for under writing, sub-under writing and responsibility of market making for three years. SEBI has mandated that the issues be 100% under written by merchant bankers, with 15% on their own accounts. The merchant bankers must also provide market making (that is, acting as a counter party to each trade), by providing two way quotes for 75% of the total trading hours ever y day for a period of at least three years, in order to infuse liquidity into the system. According to a World Bank study on Small and Medium Enterprises (SMEs), the contribution of organised and unorganised SMEs to the employment and GDP of nations is highly signiﬁcant. SME exchanges give SMEs the opportunity to raise equity through an Initial Public Offering (IPO) and then get listed on the exchange. Equity ﬁnancing will provide them opportunities to grow, acquire, innovate and contribute. Their reliance on debt will decrease, lowering their leverage and promoting healthier balance sheets. Liquidity of the stocks will attract more investors, which in turn will help the SMEs to obtain further ﬁnancing through FPOs, private placements and increased accessibility to debt. The listing alone gives an SME greater credibility and visibility. Investors view SMEs as risky investments because they lack information about these companies and their credit histories. Listing on the SME exchange would increase the visibility, analysis and media coverage of an SME, which means that there would be more credible information available to investors. It provides an immense opportunity for investors to identify and invest in emerging, high-growth SMEs and participate in the valuation of companies. This will ultimately create wealth for all the stakeholders, including investors. In addition, there are tax beneﬁts for investors. If one invests in an unlisted SME, the applicable short-term and long-term capital gains tax will be 30% and 10% respectively. However, if one invests in a listed SME, the applicable short-term and long-term capital gains tax will be 10% and 0% respectively. It will also enhance liquidity, making entr y and exits easier in the secondar y market. Increased liquidity will attract venture capitalists and angel investors who are generally sceptical about investing in smaller ﬁrms due to a lack of exit options. Apart from the above, investors will receive most of the other benefits offered on the main exchange. For example, the existing clearing and settlement mechanisms, Investor Protection Fund (IPF) provisions, risk management systems and corporate governance requirements will also apply to the SME exchanges. The launch of SME exchanges is laudable. But it is still too early to celebrate. SEBI and the exchanges must make a sustained effort to attract SMEs, hold their hands through the process and ensure a liquid secondar y market. SMEs must be made aware of the existence of the SME exchanges, the process of listing and the beneﬁts they will gain through listing. Investors must be lured into the markets and educated about the proﬁle of these SMEs and their growth potential. Merchant bankers and market makers need to be incentivised and their doubts alleviated. Regular inter ventions to make the systems and processes healthier will be required from time to time. 3. Source: http://www.msme.gov.in/MSME-Annual-Report-2011-12- Hindi.pdf. Translated from Hindi to English by the author. Accessed on May 7, 2012.